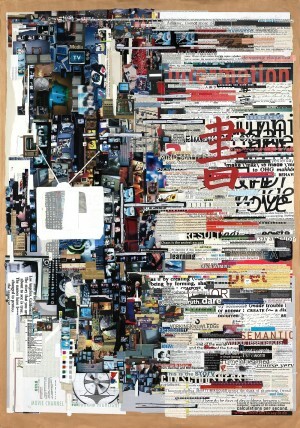 The title of one of Tm Gratkowski’s enormous collages, Wanted Her Pattern Behavior Built — now on display in the Text Message, The Alchemy of Text Based Art exhibit at the Bleicher Gallery in Los Angeles, CA — emerged from a miscellaneously and heavily layered amalgamation of hundreds of pieces of paper. After having scanned the work — top to bottom, left to right — he arranged the words that had leapt out at him, in a semi-coherent fashion. There is no preconceived blueprint for his collages, from which arises a definitive form. The Los Angeles based artist’s initial career in architecture developed out of a pension for sculpture, building, and assembling. Finding it stifling in nature, he realigned himself with his true passion: art. From an architect who had been very specific in his designs, Gratkowski has moved on to two-dimensional structures built from words and images — often juxtaposed without a sense of pattern and logic — challenging the viewer to sift through the clutter of information and develop a meaningful narrative. Other times he hovers within a specific subject matter, as in a series examining the language that critical public documents employ, such as the Bill of Rights, The Declaration of Independence, the Miranda Rights, etc. Gratkowski selects phrases and images from modern publications associated with the subject matter, making strange the syntax and diction that construct the documents that they reference — modes of communication from which mainstream voices and manners of expression have evolved. One such piece, Why Come Legally to Disrupt – Bill of Rights, is also on display at the Bleicher Gallery. Gratkowski discusses how the relationships that we form with ideas in the form of text and images reflect how we process and think about the modern world in which we live.